The Barthelmé brothers, viticulturist Maurice and winemaker Jacky, were awarded Winemakers of the Year 2012 by Revue de Vin de France. They are rated both by Wine Advocate and Vinous to be in the top tier of Alsace producers. With a three-star rating in The Classement by Revue du Vin de France, Domaine Albert Mann is now heralded the world over. 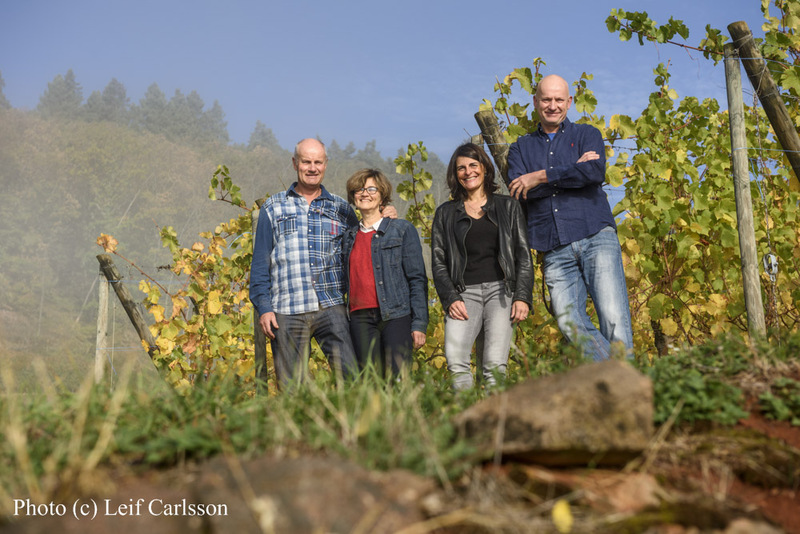 Using organic methods guided by biodynamic practices, the Barthelmé brothers cultivate precisely controlled yields to obtain grapes of elevated maturity and complex substance. From the Pinot Auxerrois, through all of their expressive Grand Crus, to the specialized Selection Grains Noble, Maurice and Jacky consistently produce their wine in their own unique style. Never heavy, clumsy or out of balance, each carefully crafted vintage presents a beautiful delineation of flavors and precise textures. Hand-harvested from Kientzheim and Wettolsheim. Expressive nose, delicate and fresh with a fine liveliness. Dominance of white fleshy fruit. Bubbles are fine and delicate. Hand-harvested from Kientzheim on the field name ALTENBOURG. Great complexity. Wine is fruity, yellow fruit, peach and apricot. Reveals vanilla and marzipan aromas. The palate is suave with a fine acidity. Gewürztraminer Grand Cru Furstentum V.V. Hand-harvested from this Grand Cru limestone site in Kientzheim. Floral bouquet of rose and violets. Beautiful complexity. Fruity on the palate, pineapple and clementine. Hand-harvested from Kientzheim and Wettolsheim. Fresh and aromatic wine. The nose is pleasant. Dominance of exotic fruit, mango and passion fruit. Hand-harvested from Wettolsheim, this marly-limestone mixed with sandstone Grand Cru site is perfect for growing spicy Gewurztraminer. Harmoniously culled spices and exotic fruits such as mango, pineapple and papaya. Great minerality and good length. Hand-harvested from Kientzheim and Wettolsheim. Expressive nose, fresh and delicious. Dominated by fresh fruits. Hand-harvested from Kientzheim and Wettolsheim. Pinot Noir, Jacky's favorite varietal, has been vinified since 1993, using traditional Burgundy methods and its certainly one of the estate's most successful wines. All of which cuvée have built up an enviable reputation. This Clos of 1 ha, perfectly partitioned and remarkably situated right in a breach area of a fault, is enclaved between the mountains of the Vosges and the small dry lawn. Hand-harvested from Wintzenheim on the Grand Cru site of Pfersigberg. Silky wine with volume on the palate. This wine is spherical without roughness. This wine is as its name (Hensgt means male horse in german) a big fiery all in powerful and finesse. Elegance, good potential for aging. Hand-harvested at Sigolsheim, from a parcel above an old monastery, "Les Clarisses". Hand-harvested selection of old vines from 2 fields names : Rosenberg (Wettolsheim) and Altenbourg (Kienthzeim). Expressive nose shows beautiful fruity flavors, citrus fruits, lemon. Attack on the palate is lively underlined by a fine minerality. Hand-harvested from this Grand Cru granite site in Kientzheim. Beautiful bottle with a great aromatic complexity, dominance of fruits, citrus fruits underline by a fine minerality. Wine of gastronomy. Hand-harvested late from this Grand Cru granite site in Kientzheim. Beautiful bottle with a great aromatic complexity, dominance of fruits, citrus fruits underline by a fine minerality. Wine of gastronomy. Hand-harvested from this Grand Cru limestone site in Kientzheim. Beautiful complexity of aromas, citrus fruits, fresh fruits, a slightly touch of lemon and spice. Attack in the palate is lively and clear. Wine with volume in the palate and show a chalky side. Pinot Gris Altenbourg "Le Tri" S.G.N. Hand-harvested from Kientzheim on the field name ALTENBOURG. Hand-harvested from Kientzheim on the field name ALTENBOURG. This wine shows a very expressive nose with a dominance of crystallized fruits, mirabelle, quince and date. Good length. Hand-harvested from this Grand Cru limestone site in Kientzheim. Great complexity on the nose, clear and elegant. A lot of fruity flavors, yellow fruit, mirabelle plus almond and caramel notes. Palate is soft with a good freshness. Pinot Gris Grand Cru "Hengst"
Hand-harvested from Wintzenheim, this marly-limestone mixed with sandstone Grand Cru site is ideal for growing Pinot Gris. A lot of powerful but a lot of restraint with an incredible faculty to digest its sugars. Brilliant final with a good length and beautiful fruity note, mirabelle.